Are Vigilante Worms the Solution to IoT Botnets? Mirai, the IoT botnet responsible for record-breaking DDoS attacks last year, has taken a hit. Thanks in part to what appear to be ‘vigilante worms’, which are either taking over or taking down the IoT devices that make up Mirai’s massive network. While these worms might have been effective in disrupting Mirai’s operations, are vigilante worms really the solution to the IoT botnet epidemic? So far, cyber security researchers have identified two worms that appear to be the handiwork of vigilantes: Hajime and Brickerbot. The former seems to be taking over IoT devices targeted by Mirai, while the latter goes a step farther, rendering the devices unusable. There’s no doubt Mirai and its ilk are serious threats to business. They already crippled several high-traffic websites and cloud-based services like Amazon, CNN, Netflix, Twitter, and The New York Times in a single DDoS event which rendered them unavailable to a large part of the United States and Europe. There’s also no question that most IoT devices are widely vulnerable to hacking. When you combine the severity of the IoT botnet threat with the vulnerability and proliferation of IoT devices, it’s easy to see how serious the risk is. While something must be done to mitigate this risk, should that include acts of vigilantism? Before tackling this question, it is important to know what we’re dealing with. Like Mirai, Hajime is a worm, meaning it’s capable of infecting a device and then spreading to other devices in the network without any human intervention. Like Mirai, Hajime also targets IoT devices. It penetrates them by scanning open Telnet ports and then breaking in using default factory passwords. Hajime has a couple of other features that’s supposed to make it more effective than Mirai. For example, instead of using a centralized C&C (Command-and-Control) server for sending commands to its bots, Hajime uses a P2P (peer-to-peer) architecture. In this architecture, the bots themselves also serve as C&Cs. To take down a botnet, you need to chop off its head by severing the C&C channel. Thus, Hajime’s network is more resilient than Mirai’s because it consists of multiple C&Cs (i.e., multiple heads to chop off) while the latter may only have one or two of them. The Hajime botnet is constantly evolving, with the authors adding new features to make it even more stealthy and resilient as well as more effective at breaking into IoT devices. Malware researchers believe it now has three attack methods. The first method can exploit an Arris cable modem’s password-of-the-day, a relatively old remote backdoor that’s been used since 2009. The second is the Telnet default password attack, which is just like the one employed by Mirai. And the third is the TR-069 exploit, a relatively new attack that exploits the TR-069 standard which ISPs use to manage modems remotely. Once it’s able to break into a device, Hajime tries to conceal its activities by hiding its running processes and accompanying files. It also enables attackers to open a remote shell over which they can issue commands. With all these advanced features, you’d think Hajime would be all set to claim Mirai’s turf. It could, but strangely, the authors of Hajime don’t seem interested in doing that. Unlike Mirai, Hajime’s not equipped with DDoS (Distributed Denial-of-Service) capabilities. In fact, in its current form, it doesn’t seem to have any capabilities for attacking other systems (except of course the IoT devices it ensnares). Instead, it simply seems to be preventing Mirai from carrying out its plans. Hajime does so by blocking ports 23, 7547, 5555, and 5358 – the very same ports normally exploited by Mirai. While those ports are blocked, Mirai is unable to break into the device. Hajime does have a few weaknesses though. Like Mirai, Hajime only gets loaded in the device’s RAM. Thus, it lacks a persistence mechanism that would allow it to stay in the device indefinitely. As soon as the device is rebooted, it would automatically be free from the Hajime infection and those blocked ports would be open (and vulnerable to either a Mirai or Hajime infection) once again. Hajime’s not the only computer worm out to spoil Mirai’s party. There’s one more, and it’s called Brickerbot. Like Hajime, Brickerbot is another vigilante worm that breaks into IoT devices by exploiting default passwords. Unlike Hajime however, which only blocks ports targeted by Mirai upon infection, Brickerbot takes a more radical approach; it bricks every IoT device it infects. More specifically, Brickerbot wipes the device clean and disconnects it from the Internet. As soon as you reboot the device or do a factory reset, you’ll realize it’s already been bricked. Naturally, a bricked IoT device can no longer be infected. It’s a rather cruel way of countering the Mirai epidemic and the author of Brickerbot knows it, calling his/her approach a form of “Internet Chemotherapy”. Chemotherapy, which is commonly used for treating cancer patients, destroys not only cancer cells, but also good cells. Janit0r, (the name used by Brickerbot’s author) thinks the ubiquity of vulnerable IoT devices and the risk they pose (i.e. massive DDoS attacks) is a critical issue that “couldn’t be solved quickly enough by conventional means.” and therefore requires a radical treatment. It takes a worm to stop a worm? 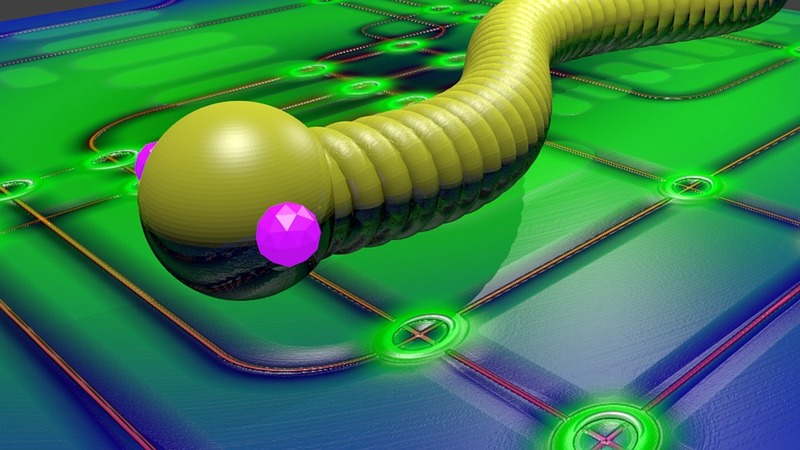 A computer worm like Mirai spreads from one device to another on its own. It doesn’t require a human being to install, download, or copy it. For this reason, a large number of devices can be infected by Mirai in a short period of time. And if you’re talking about IoT devices, that number can easily reach millions. With such a high infection rate, any undertaking for stopping this malware that relies on manual methods will surely prove futile. That’s why the authors of Hajime and Brickerbot are taking this path. They obviously think, in order to stop a worm, you need a solution with worm-link capabilities. First of all, we must remember that these worms are developed by human beings. People are fickle. What starts with noble intentions may develop into something else. Because Hajime and Brickerbot already have the ability to break into IoT devices, propagate, and lock down its victims, just a small update would be needed for them carry out more sinister acts if their authors eventually decide to turn to the dark side. These newly weaponized botnets could then be used to launch DDoS attacks or infect and brick IoT-enabled critical devices such as medical equipment. Many of the infected devices are cameras which could lead to espionage or voyeurism. Even if these worms’ developers maintain their do-good profile, several threat actors could take interest in these projects. If malicious individuals are able to hijack these worms, they could then be weaponized. Let’s also not forget the fact that, certain vigilante worms – like Brickerbot – have the tendency to inflict disproportionate punishment or unwarranted collateral damage. These worms are supposed to punish IoT device manufacturers for failing to build secure devices, but these worms are in fact destroying other people’s property. Two wrongs still don’t make a right. Nevertheless, the emergence of Mirai, Hajime and Brickerbot should serve as a wake up call to the manufacturers of IoT devices. The vulnerabilities on these devices pose a serious threat not only to the potential victims of DDoS attacks, but also to the owners of these devices who may be collateral damage to acts of cyber vigilantism. Most Internet-based tasks are dependent on DNS: web browsing, email, file transfers, social media posts, instant messaging, and a variety of communications and data exchange processes. It follows then, if you take down a DNS service, other networking services may also be rendered unusable. The concept of a DNS Denial of Service (DoS) attack is pretty simple. A concentrated attack from tens, hundreds, thousands, or even millions of machines is directed to a DNS server (or group of servers) with the intention of preventing it from providing DNS services to clients or resolvers. It’s like getting blocked from your phone’s contact list. If you can’t access your address book, you likely won’t be able to call your friends, relatives, etc. When clients and resolvers are denied access to DNS, users and machines (in the case of B2B transactions) will be unable to carry out tasks that are dependent on DNS. There are different ways of taking down or disrupting a DNS service, here are some of the most common. One of the most common types of DNS DoS attacks is the DNS Flood. This attack is carried out over the UDP (User Datagram Protocol) protocol, the primary protocol (the other being TCP) over which DNS messages are transmitted. A DNS flood attack is performed by sending out a large number of DNS requests to UDP port 53. The goal of the attack is to overwhelm the target DNS server with requests (mostly consisting of malformed or bogus packet information) and prevent legitimate requests from coming through. Although most DNS messages are transmitted through UDP, a substantial volume of messages are also transmitted through TCP (Transmission Control Protocol). DNS responses that exceed 512 bytes in size or transmissions involved in zone transfers all use TCP. For this reason, DNS servers can be vulnerable to TCP SYN Flood attacks, a type of DoS attack that exploits the TCP three-way handshake. An attacker who exploits this handshake typically sends a SYN request to the victim, which in our case would be a DNS server, but the victim doesn’t receive any ACK after it responds with a SYN-ACK. The attacker does this by either not sending back the expected ACK or by using a spoofed source IP address. 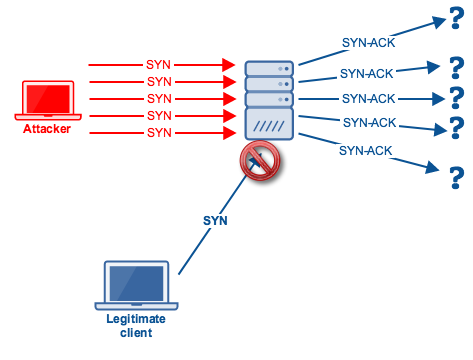 When a spoofed IP address is used, the DNS server will end up sending its SYN-ACK to the owner of the spoofed IP, who won’t respond because it never sent a SYN request in the first place. The victim then waits for the response in case the ACK was simply delayed due to poor network conditions. In the meantime, it’s forced to allocate resources for the half-open connection. In a DNS TCP SYN Flood DoS attack, an attacker directs a large number of these bogus SYN requests to a DNS server. While the victim waits for ACK responses which will never arrive, it continues to allocate resources for the partial connections. Eventually, the server runs out of resources to allocate and additional SYN requests, including those from legitimate clients, are denied. When a client or DNS resolver sends out a domain resolution request to a DNS server and the server is unable to resolve that domain into an IP address, the server responds with what is known as an NXDOMAIN response message. This response is sent when the server believes the domain doesn’t exist. In an NXDOMAIN Flood, an attacker floods a DNS server with queries for non-existent domain names. As a result, the server wastes computing resources trying to resolve domains that don’t exist. 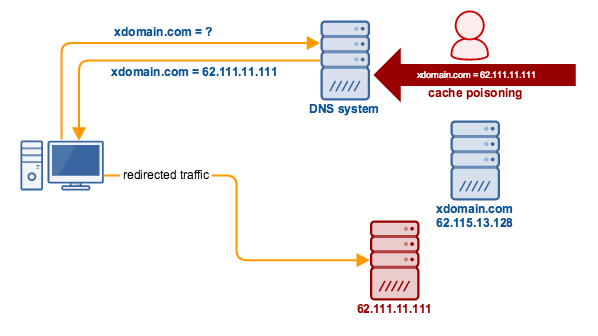 At the same time, the server’s cache accumulates NXDOMAIN results, pushing out valid cache entries in the process. When this happens, the server’s processes slow to a crawl and/or will be unable to accept additional requests, legitimate or not. 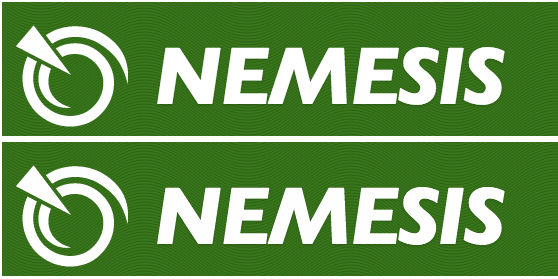 In a DNS reflection attack, the attacker sends out DNS requests to one or more DNS servers. These DNS servers aren’t the main targets of the attack, but are used as conduits for conducting the attack. The underlying trick in this attack lies in the attacker’s DNS requests, which are actually spoofed requests. More specifically, the “from” or return IP address in the requests are spoofed. When the DNS servers receive the requests, they send their responses to the spoofed IP address. Because the spoofed recipient was not expecting those DNS responses, as it never sent the requests in the first place, it uses resources trying to make sense of those responses. A few of these responses will not affect the target DNS server. However, once those responses number in the thousands, it can eventually overwhelm the target DNS server. There is also a variation of this attack that makes it easier for attackers to overwhelm the target DNS server. It’s known as the DNS Reflection Amplification DoS Attack. In the DNS Reflection Amplification DoS attack, attackers exploit a DNS characteristic wherein the response is usually larger than the request or query. In fact, there are some DNS responses (like those using ANY or DNSSEC record types) that are many times larger than the original request. The ANY request, for instance, requests ALL information pertinent to a domain. This may include MX records, A records, and several others – practically all cached records. So, the response can be much larger or “amplified”. In addition to using queries that result in large responses, attackers can also exploit open resolvers in order to amplify the attack even further. Basically, the attackers send the requests via open resolvers, which in turn store the spoofed return addresses in their respective caches. Once the spoofed return addresses are already cached in a large number of open resolvers, those cache-poisoned resolvers can then be used to launch a massive DDoS attack against the target DNS server. Today’s attacks on DNS systems have gotten more disruptive. What used to be simple DoS (denial-of-service) attacks have now evolved into much larger DDoS (Distributed Denial-of-Service) attacks. These attacks are typically launched from botnets, (a network of compromised computers that receive commands from attackers. Instead of a single machine (or a handful of machines) sending out malicious/bogus packets to a DNS system, a DDoS attack may now involve thousands of machines. Cyber criminals have also devised methods to ensnare IoT (Internet of Things) devices and build massive botnets out of them. Due to the considerably large number of insecure IoT devices already in use, DDoS botnets can potentially consist of hundreds of thousands or even millions of compromised devices. As a consequence, DDoS attacks are now much more disruptive than ever before. The IoT botnet DDoS attack on DNS provider Dyn last year, which had an estimated throughput of 1.2 Tbps and was said to be twice the size of the previous largest DDoS attack on record, managed to block users from practically the entire US East Coast and many parts of Europe. Unless IoT manufacturers start taking security seriously and address the vulnerabilities that plague IoT devices, the threat of massive DDoS attacks on DNS systems will remain. The availability of your business is now closely tied with the availability of your network, which is in turn highly dependent on the availability of DNS services. 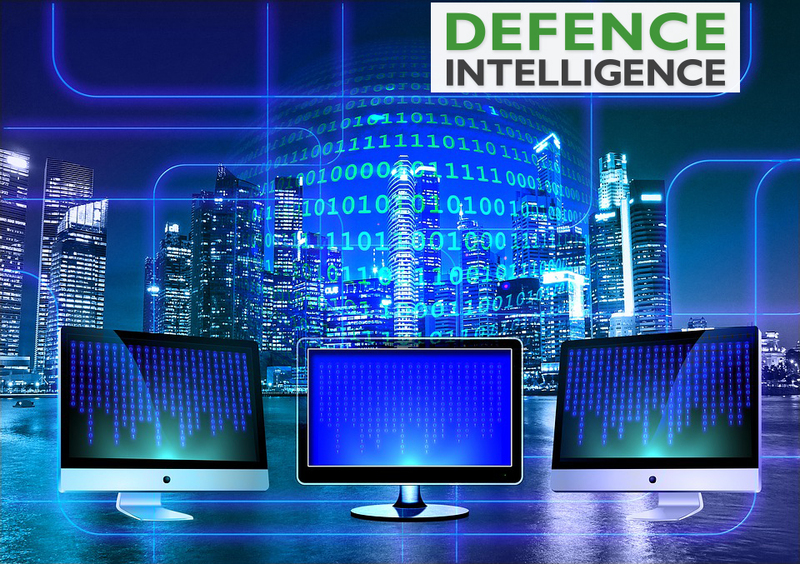 In order to prevent major disruptions to your business due to DNS denial-of-service attacks, your DNS must be an integral part of your defence strategy. Learn how. DNS servers are vital to almost every process that takes place on the Internet. They allow us to browse the web, transact on an e-commerce site, chat via instant messaging, send out file transfers, communicate through email, etc. So when these DNS servers are compromised or somehow fail, the services that rely on them can be adversely affected. That’s exactly what happened last October when a DNS provider serving popular websites like Twitter, Amazon, AirBnB, CNN, Comcast, Spotify, Tumblr, Wired, and many others, got hit by a massive DDoS attack. From the point of view of the end users, those sites appeared to be down. While their servers were technically available, they weren’t reachable. That’s because the DNS system users relied on to get to those sites were out of commission. The main function of the Domain Name System (DNS) is pretty simple; it’s designed to associate certain information to domain names. DNS is responsible for resolving IP addresses to hostname/domain names and back. This is necessary because the servers that host sites like xdomain.com or ftp.somedomain.edu are actually identified by client machines through IP addresses like 62.115.13.128 or 210.213.130.182 and not through the domain names xdomain.com or ftp.somedomain.edu per se. The client machines – i.e., desktops, laptops, tablets, smartphones, or other servers – need to know what those IP addresses are before they can establish a connection. When a user types something like xdomain.com into a browser, that request will first have to go through a DNS server. The DNS server (or more specifically, a chain of DNS servers) will then take that domain name, resolve it into the IP address that matches the domain name and then provide that information to the requesting client. Only then can the client connect to the xdomain.com server. Without the DNS system, there’s no way the user will be able to connect without knowing the corresponding IP address for xdomain’s server. Threats to data integrity in a DNS system pertain to threats that may result in intentional or accidental modification of data in a DNS system. There are certain pieces of data used in DNS which, if tampered with, can lead to serious consequences. For example, if the Resource Records (RR) that are stored in zone files, memory or cache, are tampered with or if the responses to legitimate queries are tainted with bogus information, users can be redirected to other (potentially malicious) sites. The most common type of attack aimed at damaging the integrity of a DNS system is cache poisoning. The objective of this attack is to force a DNS server to cache bogus information; usually a domain name mapped to the wrong IP address. As a result, when a client submits a legitimate query to the DNS system, the system will then reply with the wrong information. Once a cyber attacker succeeds in redirecting traffic to a malicious site (presumably also controlled by the attacker), bad things can happen. These sites are often meticulously crafted to resemble the legitimate site so that redirected users can be deceived into entering sensitive information like passwords, credit card data, and personally identifiable information (PII). These are the types of threats that render DNS servers inaccessible. When that happens, DNS queries may go unanswered. As a result, clients will be unable to reach the sites they’ve been meaning to connect to. DNS outages can be caused by unintentional server failures or deliberate DoS/DDoS attacks. An IoT botnet DDoS attack was responsible for the Dyn outage. That attack, which was the largest DDoS attack on record, was noteworthy in that it was launched from an army of compromised IoT devices. This is a serious threat because, if it could bring down an infrastructure as robust as Dyn (even just for a few hours), it could easily overwhelm the infrastructures of much smaller DNS providers. Threats to the confidentiality of data in DNS systems are not as glaring as the other two, but shouldn’t be taken lightly. If, for example, RRs for internal hosts are stored in external name servers and those servers are compromised, the information obtained can provide attackers insights about the internal network. This information can then be used to support and inform subsequent stages of an attack. One of the tasks many security consultants perform in the early stages of a penetration testing engagement is DNS reconnaissance. DNS reconnaissance can reveal a lot about an organization’s DNS servers, their RRs and, in turn, the organization’s network infrastructure. The impact of a DNS attack on businesses can vary greatly depending on the threat. If it’s an attack on the confidentiality of DNS data, the impact could be minimal. However, if that incident was actually just reconnaissance that eventually led to a deeper penetration of the network, or a data breach, the impact could be huge. If the data breach involved personal information, the business could face legal action or hefty. 1.The owners of the client machines. Once these machines are redirected to malicious sites, the owners of these machines could suffer financial losses or loss of confidential information (e.g. credit card data or PII). 2.The owners of the spoofed sites. The moment word of the fraudulent transactions gets out (and spreads through social media), the businesses who own those sites could suffer irreparable brand damage. They could also suffer financial losses as they try to remediate the problem or defend themselves against lawsuits. If it’s the availability of DNS services that’s compromised, the biggest consequences are likely to be in terms of opportunity and trust. If you have an online business (e.g. an e-commerce, or online banking site) and your DNS provider suffers a lengthy outage (say, several hours), the loss in terms of sales could be massive. The Cloudflare incident that derailed weekend plans for many cyber security professionals is turning out to be a huge eye opener. The culprit, a bug now known as Cloudbleed, resulted in a serious data leak which affected an abundance of websites. As the dust began to settle, it became clear that the implications were far more severe than anticipated. The Internet has undergone considerable changes, and security issues must now be handled differently. 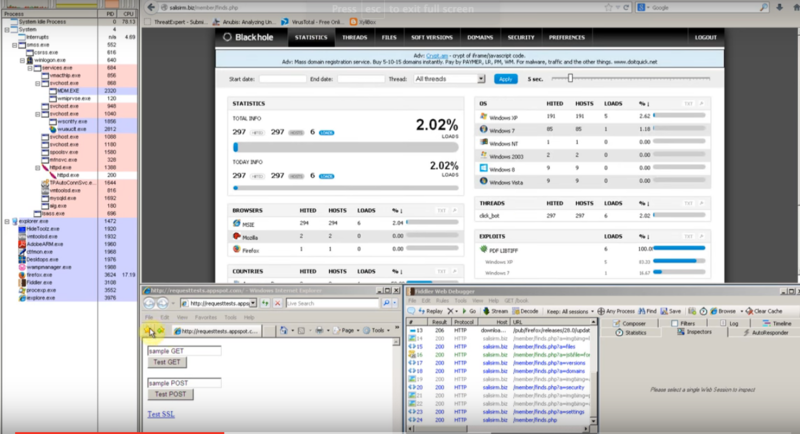 The above image is that of a Cloudflare feature in action. It serves the purpose of protecting the site that a given individual is about to visit, keeping it safe from spammers and bots by making sure the person is, in fact, human. Cloudflare is a content delivery network that also provides DDoS protection, web application firewalls, DNS (domain name server), and reverse proxy services. This network serves millions of websites, acting as a layer between those sites and their visitors. That has some advantages and disadvantages. One disadvantage is that if something goes wrong at that layer, a lot of websites are going to be affected. Cloudbleed was a bug in the Cloudflare infrastructure that resulted in a data leak involving passwords, keys, cookies, POST data, and HTTPS requests; the whole nine yards. Some of this data, which came from Cloudflare customer websites, included PII (personally identifiable information), private messages, and other confidential information. Although data would only leak out if certain conditions were met, the sheer size of Coudflare’s customer base made the incident a major issue. To make matters worse, some of the information that leaked was caught by search engine crawlers and cached into memory. This means that, even after the bug was identified and fixed, one critical, and rather tricky, task still remained. Cloudflare had to work with Google and other search engine providers to make sure leaked data was completely scrubbed from search engine caches. Otherwise, the data would run the risk of being targeted by shady (or simply curious) characters as soon as details of the security incident broke out. Automatic HTTPS Rewrites – a feature that rewrites HTTP links to HTTPS. In addition, the bug was only triggered if (in addition to any of those features being enabled) the HTML page that was served was malformed, i.e. the page had to end with an unterminated attribute. However, because much of Cloudflare’s infrastructure is basically shared by its large customer base, a lot of websites were still affected by the bug – even if those sites did not have any of those three features enabled. Some of the popular websites known to have been impacted included Uber, Fitbit, and OkCupid. A much longer list of potentially affected sites can be found on Github. In order to perform their specific functions, all three features – email obfuscation, server-side excludes, and automatic HTTPS rewrites – have to parse and modify HTML pages as the pages pass through Cloudflare’s edge servers and are subsequently served to clients. To do this, the three features rely on what is known as an HTML parser. It was this HTML parser that contained the bug, which in turn caused random memory leaks. Cloudflare’s detailed explanation can be found here for those wanting to dive into more technical information. The data leak was accidentally discovered by Tavis Ormandy, a security analyst at Google’s Project Zero. When he and other members of the team managed to fetch some live samples, they were able to obtain data that should not have been out in the open – encryption keys, cookies, passwords, chunks of POST data and even HTTPS requests. As soon as they were able to pinpoint Cloudflare as the source of the leaked data, they immediately tried to establish contact with Cloudflare’s security team. Tavis decided to reach out through twitter. Fortunately, some members of the Cloudflare security team were active on social media and word of the tweet reached them. This led to a series of exchanges and some collaborative work. The bug was found and a patch was deployed in less than a day. As soon as the bug’s location was identified (but before a patch was released), Cloudflare initiated what they called a “global kill” switch that disabled the features in question throughout their global network. However, it did take more time to work with the search engine engineers in purging leaked data that was already cached. After further investigation, it was later discovered that the bug may have been leaking data for months. The leak is estimated to have stretched from late September 2016 to February 2017. That estimated period over which data leaked is quite alarming, considering that search engines aren’t the only entities who mobilize crawlers across the Web. Ideally, leaked data cached in those systems would be purged as well. To be on the safe side, all Cloudflare customers must assume that their sites might have leaked some amount of data and take appropriate measures. Some of the countermeasures include resetting passwords, forcing re-authentication, invalidating session cookies, rolling internal authorization tokens, adapting two-factor authentication, and educating users of potential risks. Cloudbleed (and the recent Amazon outage) indicates a couple of things. First, that the Internet, as many of us know it, is now heavily dependent on just a handful of organizations. The downside is that, when something goes wrong with the infrastructure of those few organizations, a massive fraction of the Internet – and everyone using it – suffers. Indeed, if services from the top providers like Amazon and Cloudflare go offline or acquire some form of vulnerability, a lot of businesses will be affected. There is, however, an upside to this. Because things are provided as-a-service by a single provider, a fix can be made in a central location and then rapidly propagated across all nodes. In the case of Cloudbleed, a simple activation of a kill switch at Cloudflare switched off all affected features, thereby plugging the holes throughout its entire global infrastructure in a matter of seconds. As soon as the bug was fixed, that fix was then propagated throughout the infrastructure, almost instantly. 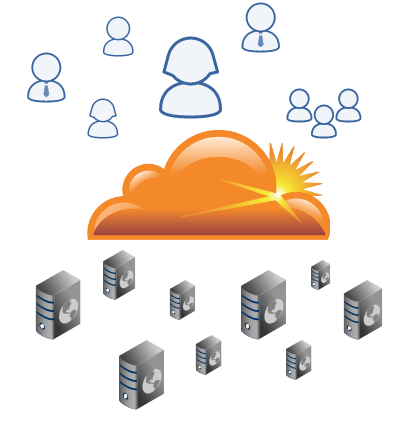 The rise of ubiquitous cloud service providers has altered the Internet landscape in a big way. In order to mitigate the risks that accompany this new landscape, on can take the lessons learned from Cloudbleed into consideration when developing new security strategies. Despite the many tools in place to prevent them, phishing attacks continue to be a menace to employees and businesses. In Q3 of 2016, the Anti-Phishing Working Group detected at least 340 hijacked brands per month. In the last month of that same period, they also found 104,973 unique phishing sites. In order to understand the implications of these statistics, one needs to gain a better understanding of phishing attacks, the motivations behind them, why they succeed, and their impact to business. In a nutshell, a phishing attack is a fraudulent message, usually in the form of an email, which lures users into clicking a link. That link in turn either leads the victim to a malicious website or initiates a malicious download. Phishing email is a form of spam email; it’s an undesirable message sent in bulk to a large number of recipients. While traditional spam emails are mostly part of advertising campaigns, phishing emails are more sinister. The main goal of a phishing email is usually to obtain confidential information from the email’s recipient. First, the phishing email is sent to a large collection of email addresses. These days, the mass mailings are launched from zombie computers or devices that belong to botnets. If the phishing email was well crafted, the victim would be compelled to either click on a link found in the email body, or download an attachment. 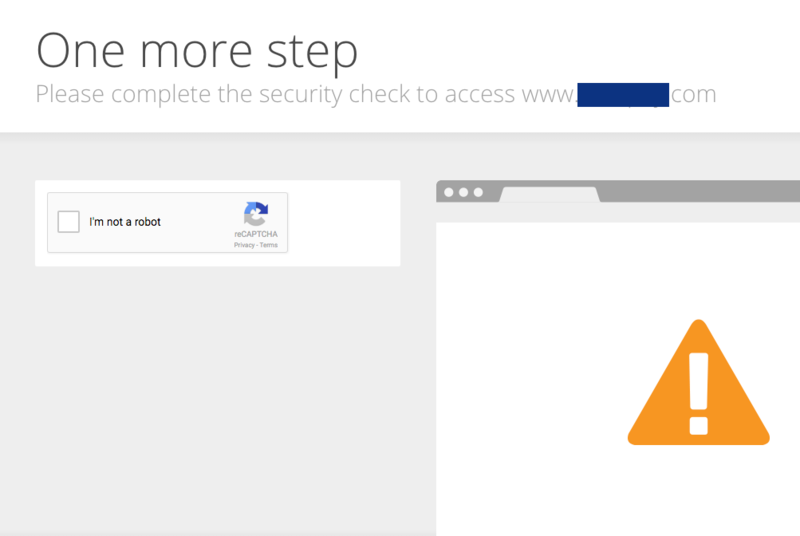 If the victim clicks on the link, he or she will likely be redirected to a landing page closely resembling a legitimate webpage of a popular and trusted company. Most of the organizations impersonated are banks, credit card companies, online payment service providers (e.g. PayPal), and even social networking sites. The use of a reputable brand name increases the probability of the victim performing the desired action (e.g. fill out a form or download a file). If the victim downloads an email attachment, he or she will likely end up installing a trojan that might contain a key logger, botnet client, ransomware, or just about any other type of malware. The goal of most phishing attacks is to acquire what is known as personally identifiable information, or PII. This information includes data that, either individually or combined with other relevant data, can be used to identify an individual. Examples of this kind of data would include social security numbers, bank account numbers, credit card numbers, medical records, educational records, mailing addresses, biometric records, and so on. Stolen PII is often sold in shady online marketplaces, where they will then be purchased by identity thieves. These cybercriminals then use the information to carry out credit card or banking fraud and other fraudulent transactions. The cost of a single piece of stolen personal information can range from a few dollars to thousands of dollars, depending on the specific information that has been obtained. For example, a random credit card number can cost $5; a medical record, $50; and a bank account credential, $1,000. Looking at the total value of PII belonging to thousands of individuals makes it is easy to understand why phishing can be so lucrative. Phishing relies on the time-tested art of deception. These days, cyber security experts and cyber criminals have dubbed these deceptive acts “social engineering.” Social engineering plays on people’s emotions, curiosity, fear, or plain gullibility. Most people get excited when they are told they won something – even if they never bought a ticket for any “2017 Online Lottery” in the first place. The message above can be quite alarming and can spur a sense of urgency. For this reason, some recipients of this email would no longer stop to think and just do as instructed. These deceptive messages are made more believable with the advent of HTML-based emails. Unlike plain text emails, HTML-based emails can be spruced up with graphics and formatted text. Hence, it’s easier to make them resemble official communications from a trusted or reputable source – like a bank or, in the example above, Paypal. When people are faced with a well-written and professionally formatted email bearing a trusted logo, most of them won’t bother to verify its authenticity. Traditionally, phishing emails followed a spray and pray tactic. Attackers typically sent out large volumes of emails without any regard as to who would end up receiving them. For example, of the thousands who would receive the “Paypal” email, only a few may actually own a PayPal account. As a result, the majority of those who would receive the email would mark it as spam. To increase the efficiency of their attacks, phishers started resorting to more sophisticated techniques. One of these techniques is known as spear phishing. This is a more targeted phishing attack aimed at a specific individual or group of people. 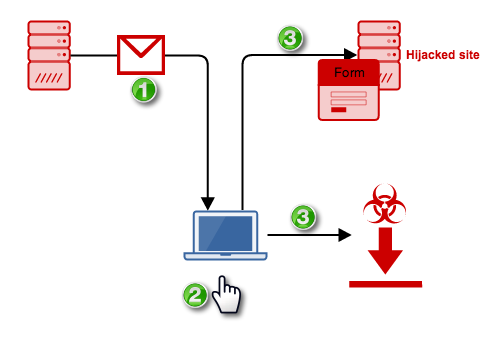 Spear phishing emails contain elements closely associated with the target. For example, a spear phishing email may mention and may appear to originate from the target’s boss, their organization’s network administrator, or HR manager. In addition, it may follow the company’s standard email format and include the corporate letterhead. Because spear phishing emails are so customized, their open rates and click-through rates are quite high. The people who conduct spear phishing attacks usually have even more sinister intentions in mind than just stealing PII. 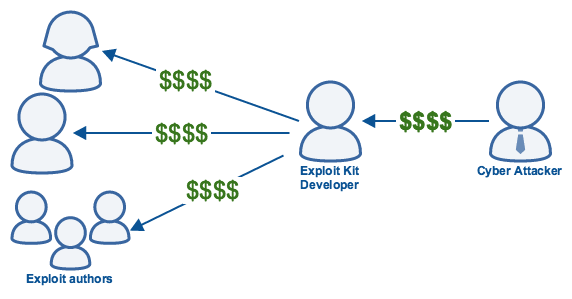 Many of these attackers are often after high value targets buried deep inside the organization. Hence, the main purpose of the phishing attack might be to acquire administrative credentials for privilege escalation or to infiltrate the network in preparation for an APT (advanced persistent threat) campaign. Spear phishing emails are typically laced with malicious attachments that often take the form of corporate files like PowerPoint presentations, reports, spreadsheets, resumes, and business documents. While these files appear as common file formats like .PDFs, .PPTs, .DOCXs, and .XLSs, they are actually executable (.EXE) files containing trojans that may even connect to remote command-and-control (C&C) servers. Although phishing attacks are primarily aimed at individuals (more specifically, their PII), they can have other unintended, but nevertheless unavoidable casualties as well. When phishers launch an attack, they usually need to hijack a legitimate brand. As discussed earlier, attackers typically set up a malicious landing page that closely resembles the web page of a trusted brand. This makes it easier to convince victims into responding to a call-to-action, such as filling out a form or downloading something. These brands become casualties once the phishing campaign is discovered and later disclosed in news outlets or social media. This type of publicity can hurt the brand’s image, leaving the impression that its web pages are unsafe. Some customers might end up avoiding the brand’s legitimate websites for fear of accidentally landing on a fake web page. In most cases, the people who do land on a hijacked brand’s website are likely customers of that organization. These people can lose confidence in the brand and may ultimately drop it for a competitor. Worse, if they actually become victims (i.e. their personal data get stolen), they might even file a lawsuit, or, if the data is covered by data protection regulations, the company can be levied fines for noncompliance. There are a couple of ways to thwart phishing attacks, the first of which being user education. This method of avoidance is primarily designed to counter the social engineering aspect of the attack. Because users are the recipients of phishing emails, your employees must be trained to determine when an email can be considered suspicious. Messages that elicit heightened emotions, whether of happiness, fear, pity, etc. Although user education is an important component in countering phishing attacks, it is by no means ironclad. Employees can forget or even disregard warning signs; hence, one will need to augment user education with something immune to human shortcomings. Learn how our DNS Security Solutions can help detect and block fraudulent links, phishing campaigns, rogue antivirus downloads, and forced redirection to malicious domains. There are few worse ways to start the new year than scrambling to recover urgently needed files encrypted by ransomware. Unfortunately, the chances of that happening in your organization only seems to be growing. What’s more, although ransomware infections are arguably the most publicized, they’re not the only malware poised to pounce in the Year of the Rooster. 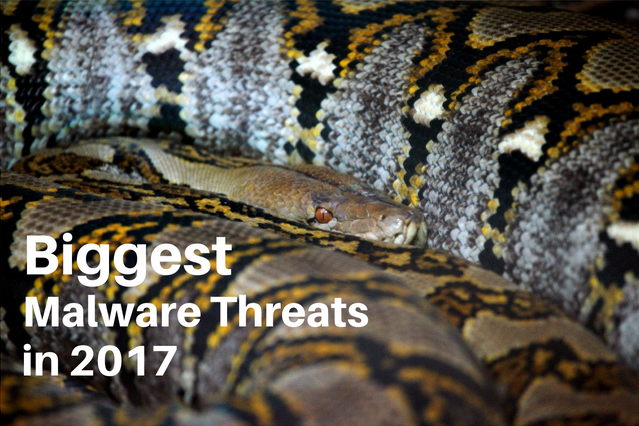 Easily the most disruptive, and publicized malware of 2016, ransomware is positioned to become a much bigger threat in 2017. Ransomware cyber crooks raked in no less than $1 billion last year. The amount of profit that can potentially be earned from this type of malware is enough to attract even more cyber criminals. 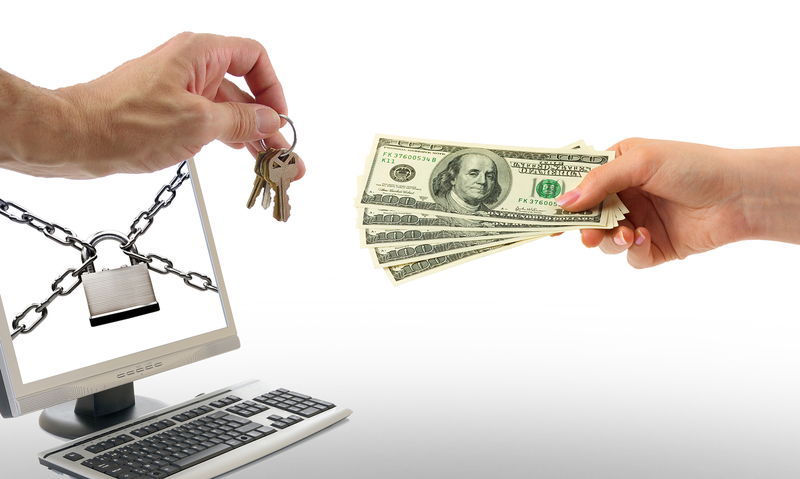 It’s easy to see why launching ransomware attacks is a lucrative business model. A large number (if not most) of victims are willing to pay. We discussed the possible drivers behind ransomware’s recent rapid growth in the blog post “The Secrets Behind Ransomware’s Surging Notoriety”. Android continues to dominate the mobile market, as well as the mobile malware market. The Android platform has long been plagued with vulnerabilities and in July 2016 alone, Google released a massive security update that aimed to address 108 vulnerabilities in Android. Just last week, security researchers discovered what is now known as the Switcher Trojan, malware that infects Android devices and uses them to attack routers, altering the router’s DNS settings and rerouting DNS queries to attacker-controlled networks.